Yes , you read right, I'm doing a product review. Guess what, it's for a product that at the moment Daisy can't even use but I think it's so fab I wanted to review it and tell you all about it. Over the years, as the world has become more savvy about providing for the needs of disabled children products have been developed that are aimed at making their, and their parents lives a bit easier. When I saw the GoTo seat I just wished it had been around a few years ago when Daisy was a bit smaller - because it would really have been a godsend. How often did we find ourselves leaving Daisy confined to her special needs buggy in restaurants because the high chairs were not safe for her to sit in with her poor tone, or travelling to visit friends, we would have to lug her large, special needs chair which did not fold down and took up even more space in our full to the brim car. Leckey, a brand well known to us parents with children with physical disabilities, has worked with Cerebra (the charity for children with neurological disorders) to develop the GoTo Seat. It's marketed under the Firefly brand, a new range of Leckey products that are cost effective and accessible for parents without having to go through the rigmarole of getting assessments and funding. How I wish this had been around when Daisy was little and we waited months for appropriate seating and support for her while the bureaucratic wheels turned. So the GoTo seat is basically a shell (weighing1.4kg) which can be attached to a chair to provide better postural support . 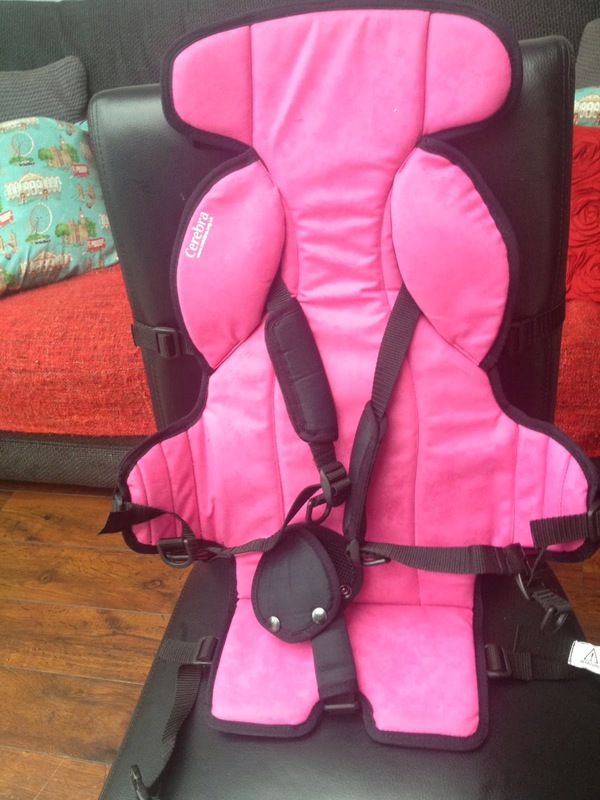 It incorprates a five point harness and support to the side and head areas. The possibilities are endless - the supermarket trolley, the swing in the park, in our case turning a cheap ikea child's chair into a decent support chair, out and about on dining chairs, high chairs. 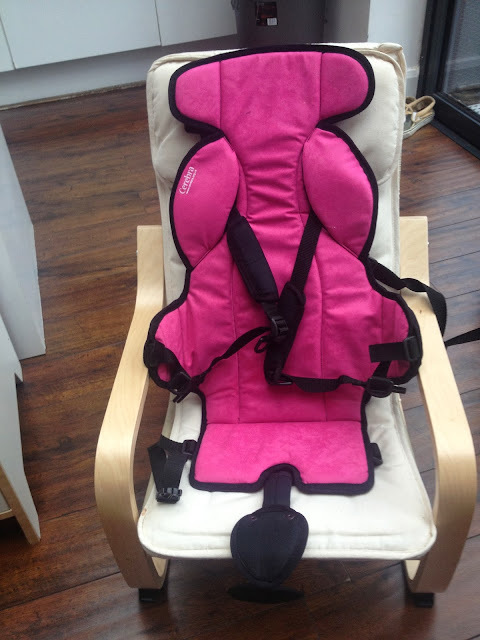 It's perfect if you have a child with mild to moderate tone and postural issues. At the moment the seat is only produced in one size, suitable for a maximum weight of 13kg, however I have been told that a bigger seat is going to be launched in the spring. The only criticism I have is that it could do with some extensions for the straps that are used to tether the seat to chairs etc - it you have a particularly wide dining chair then it's impossible to get the straps to do up underneath (see picture below). Apart from that it's a great product, turns an ordinary chair into a more supportive chair for a child with poor postural control and being so lightweight and compact it's perfect for travelling (although, not, I hasten to add, as a car seat). The seat costs £125, ex Vat (but as it will be used for a disabled child it will be Vat exempt as long as you fill in a simple form) and 7% of the money will go back to Cerebra to support their excellent work - everyone wins!